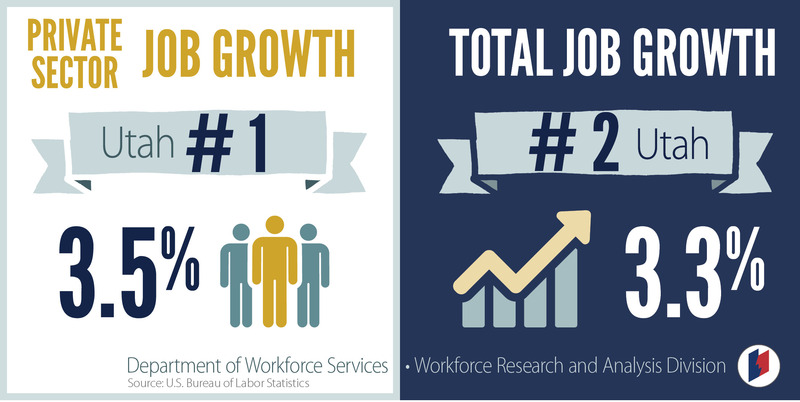 ST. GEORGE — New data released by the U.S. Bureau of Labor Statistics shows robust job growth numbers for the state with top rankings in private sector job growth and overall growth. The new numbers rank Utah No.1 in the nation for private sector job growth at 3.5 percent and No. 2 for overall job growth at 3.3 percent, slightly behind Idaho’s 3.4 percent. The numbers were even higher for the St. George metropolitan area with the growth rate of private sector jobs at 4.8 percent and overall growth at 4.6 percent. 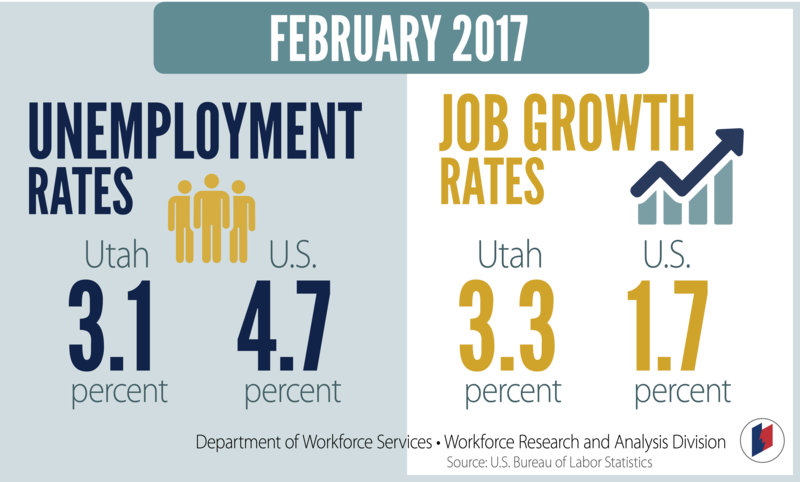 “Because of the hard work Utahns put in every day, we are leading the nation in both private sector job growth and overall job growth,” Gov. Gary Herbert said in a news release issued by the governor’s office. Payroll employment grew by an estimated 3.3 percent, adding 45,700 jobs to the economy since February 2016. Utah’s current employment level registers 1,445,000 non-farmworkers. Utah is also among the lowest states in unemployment rate, ranking seventh at 3.1 percent. Numbers released by the state’s Department of Workforce Services as recently as February show that the seasonally-adjusted unemployment rate held steady from January at 3.1 percent. Approximately 47,500 people were unemployed and actively seeking work. During the same timeframe, the national unemployment rate decreased one-tenth of a percentage point from January to 4.7 percent. Washington County’s unemployment rate stands at 3.3 percent, down from 3.9 percent a year ago. Eight of the 10 private sector industry groups measured in a survey posted net job increases in February as compared to last year, while the natural resources and mining industry decreased by 800 positions and the information industry shed 600 positions. From a regional perspective, all 10 of private sector industry groups saw net growth in the St. George metropolitan area. I wonder how many of those jobs are a second job for an individual since wages are no where near enough to match the cost of living. Theone has a valid point that should not be ignored by the polls and yet the polls ignore it. I am in awe of how many people I work with have 2 jobs just to be able to afford to keep a roof over their head, a vehicle to drive, and put food in the house. The numbers are remarkably high. 7 out of 10, the other two out of 10 are retired and receive Social Security and work part time and then there’s one out of 10 that this is their only job. Those are my unofficial numbers. The polls don’t show the truth they just show a number. The next question is: let’s use a family of four as an example. How many people that have two jobs and have two kids are on government assistance because their wages do not support a family of four?